Being able to translate research finds into practical applications on a construction site is never a sure thing, but having a lab-to-studio pipeline definitely helps. 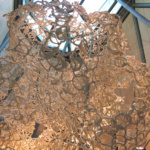 For Jenny Sabin, that means a close integration between her lab at the Cornell College of Architecture, Art, and Planning (AAP), and her eponymous studio in Ithaca, New York. Sabin wears three hats: A teacher with a focus on emerging technologies at Cornell, principal investigator of Cornell’s Sabin Design Lab, and principal of Jenny Sabin Studio. The overlap between the lab and the studio means that Sabin has an incubator for fundamental research that can that can be refined and integrated into real-world projects. 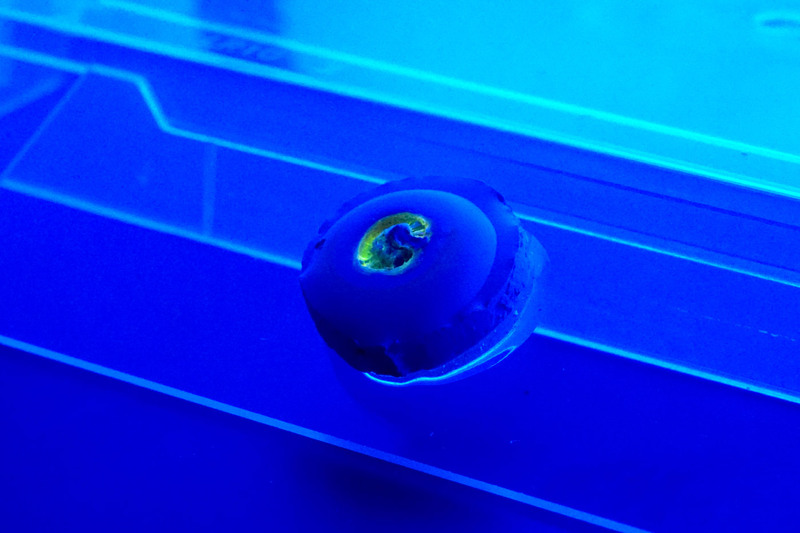 When AN last toured the Sabin Design Lab, researchers were hard at work using robot arms for novel 3D printing solutions and were looking at sunflowers for inspiration for designing the next generation of photovoltaics. 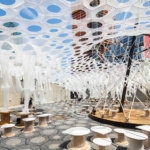 The projects stemming from fundamental research have been realized in projects ranging from the ethereal canopy over MoMA PS1’s courtyard in 2017 to a refinement of the studio’s woven forms for a traveling Peroni pop-up. 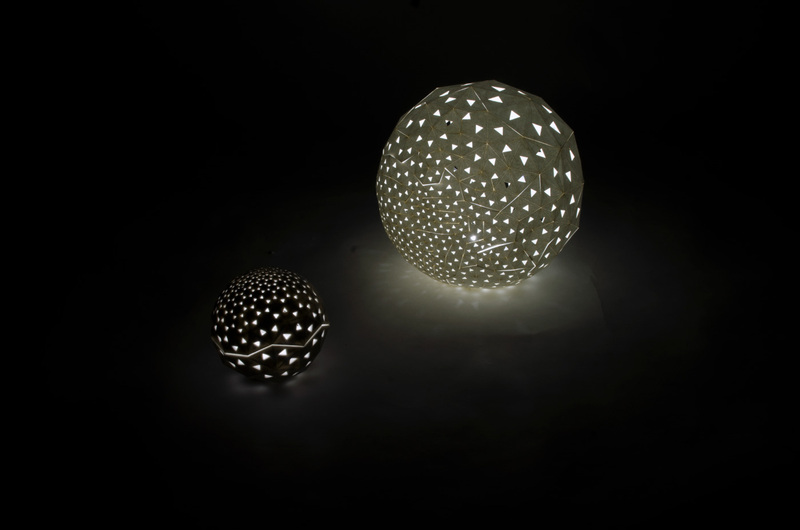 Rather than directly referencing nature in the biomimetic sense, Sabin’s projects instead draw inspiration from, and converge with, natural processes and forms. Here are a few examples of what Sabin, her team, and collaborators are working on. Brick and tile have been standardized construction materials for hundreds of years, but Sabin Design Lab’s PolyBrick pushes nonstandard ceramics into the future. The first iteration of PolyBrick imagined an interlocking, component-based “brick” that could twist, turn, and eliminate the need for mortar. 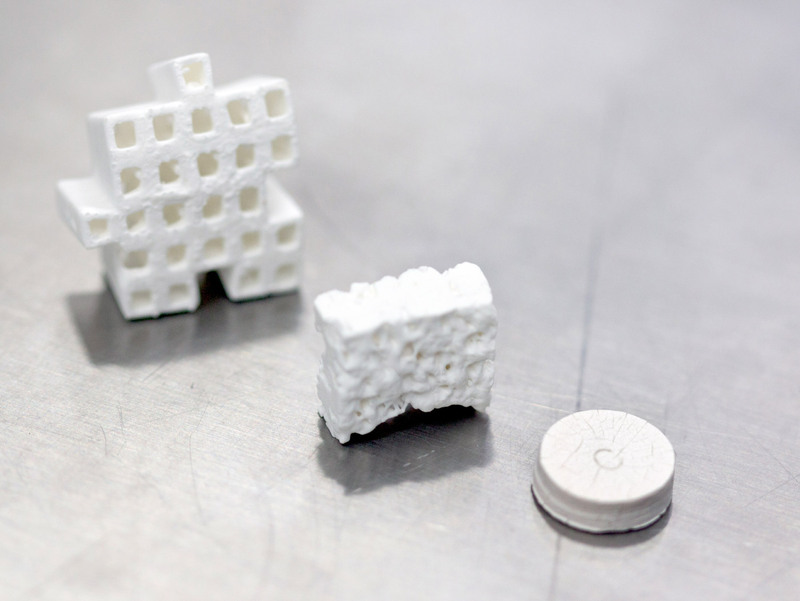 PolyBrick 1.0 used additive 3D printing to create hollow, fired, and glazed ceramic blocks that could one day be low-cost brick alternatives that would enable the creation of complex forms. 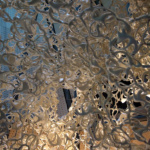 PolyBrick 2.0 took the concept even further by emulating human bone growth, creating porous, curvilinear components that Sabin and her team of researchers and students hope to scale up to wall and pavilion size. PolyBrick 3.0 is even more advanced. 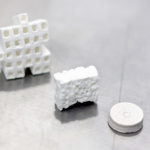 The 3D-printed blocks contain microscopic divots and are glazed with DNA hydrogel; the polymer coating can react to a variety of situations. 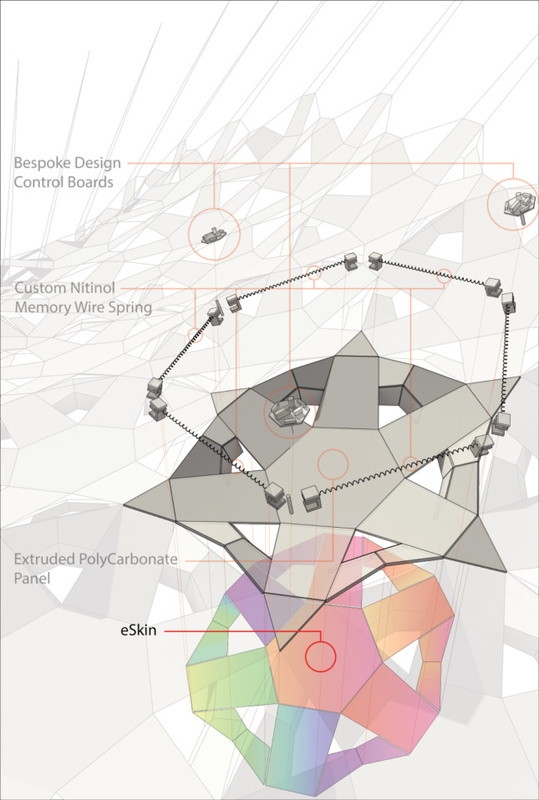 Imagine a bioengineered facade glaze that can change color based on air pollution levels or temperature changes, or a component “stamped” with a unique DNA profile for easy supply chain tracking. As Sabin notes, knitting is an ancient craft, but one that laid the foundation for the digital age; the punch cards used in early computers were originally designed for looms. 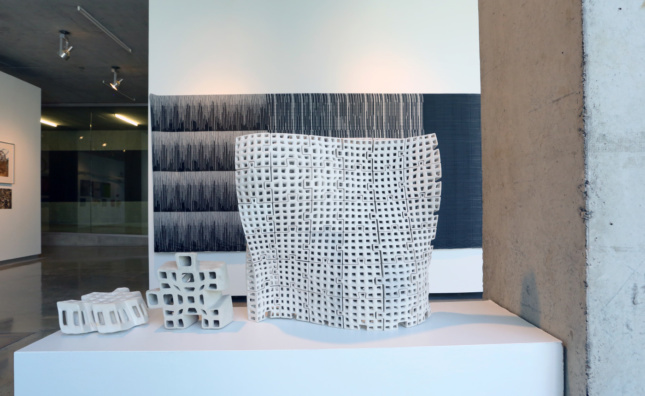 As material requirements evolve, so too must the material itself, and Jenny Sabin Studio has been experimenting with lightweight, cellular structures woven into self-supporting forms. 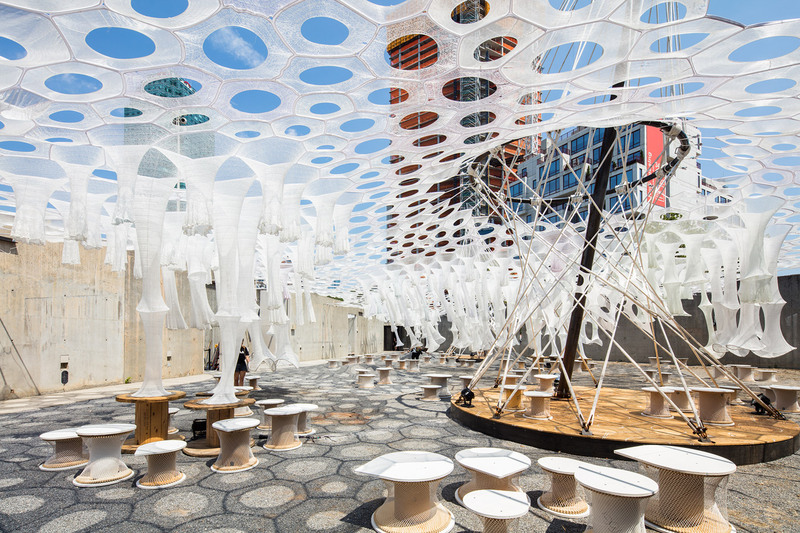 Sabin’s most famous such installations are gossamer canopies of digitally knit, tubular structures that absorb, store, and re-emit sunlight at night to illuminate repurposed spool chairs. 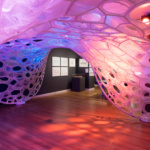 MoMA PS1’s Lumen for YAP 2017, House of Peroni’s Luster, and the 2016 Beauty-Cooper Hewitt Design Triennial installation PolyThread have all pushed textile science forward. 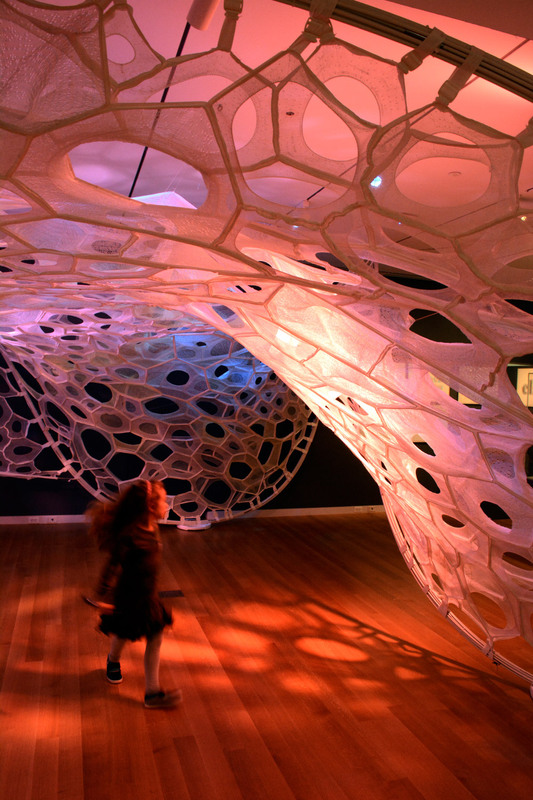 As opposed to rigidly defined stonework or stalwart glass, woven architecture takes on ambiguous forms. 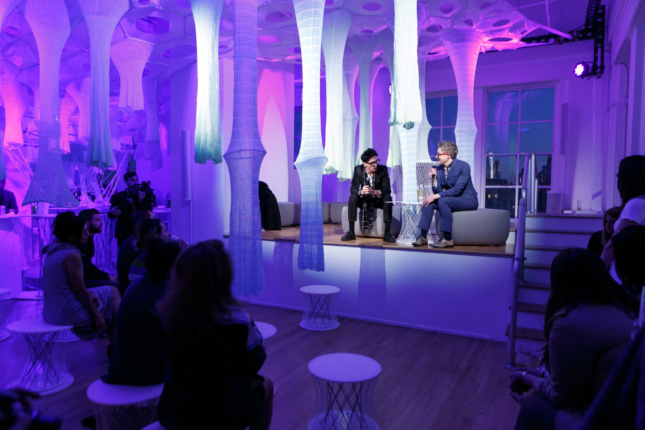 As GSAPP’s Christoph Kumpusch pointed out while in conversation with Sabin at the House of Peroni opening in NYC last October, these tensile canopies proudly display their boundary conditions instead of hiding them like more traditional forms. 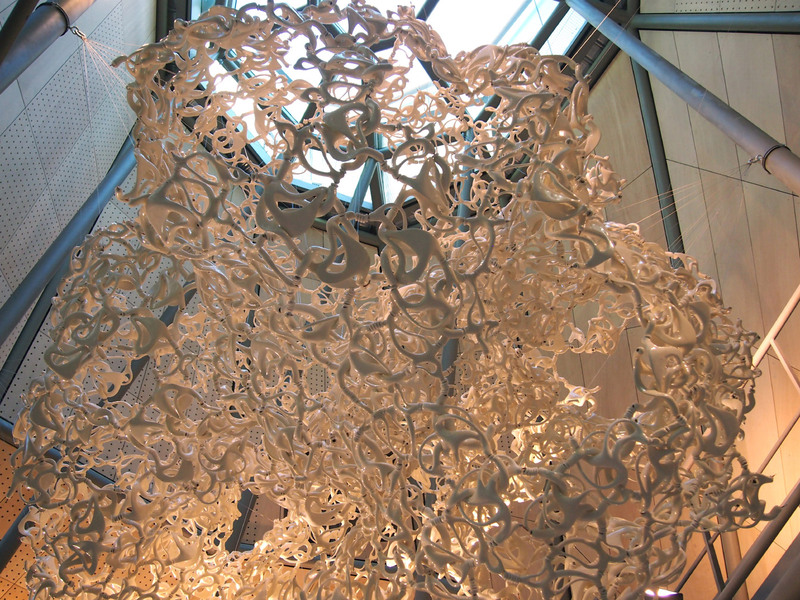 The dangling, sometimes-expanded, sometimes-flaccid fabric cones extrude from the cells of the woven canopy and naturally delineate the programming of the area below. 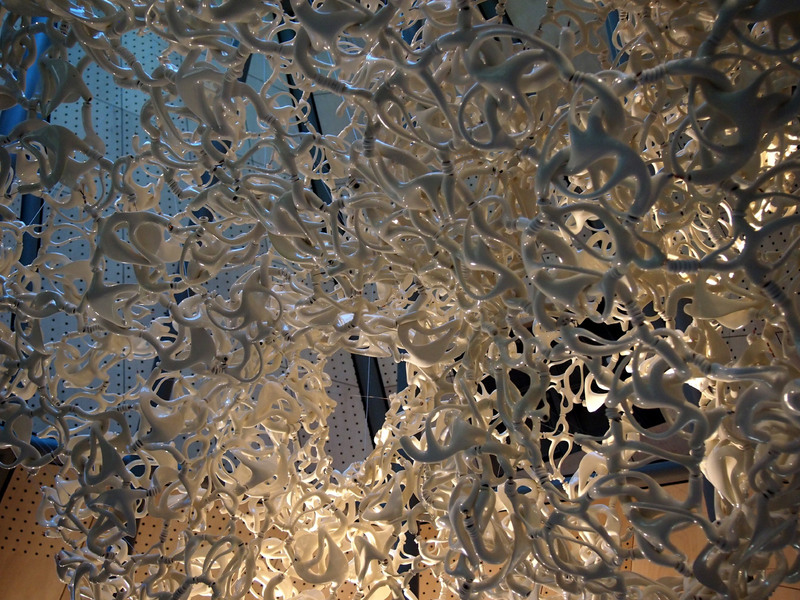 These stalactites create the feeling of wandering through a natural formation and encourage a playful, tactile exploration of the space. Origami and kirigami (a form of paper folding that requires cutting) are traditional practices that, like other techniques previously mentioned, have seen a modern resurgence in everything from solar sails to airbags. The Sabin Lab has taken an interest in kirigami, particularly its ability to expand two-dimensional representations into three-dimensional forms. 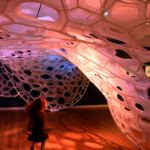 The lab’s transdisciplinary research has blended material science, architecture, and electrical engineering to create rapidly deployable, responsive, and scalable architecture that can unpack at a moment’s notice. Two projects, ColorFolds and UniFolds, were made possible by funding from the National Science Foundation. 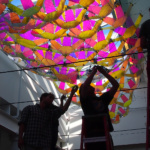 ColorFolds was realized as a canopy of tessellated “blossoms,” each made from polycarbonate panels covered in dichroic film. 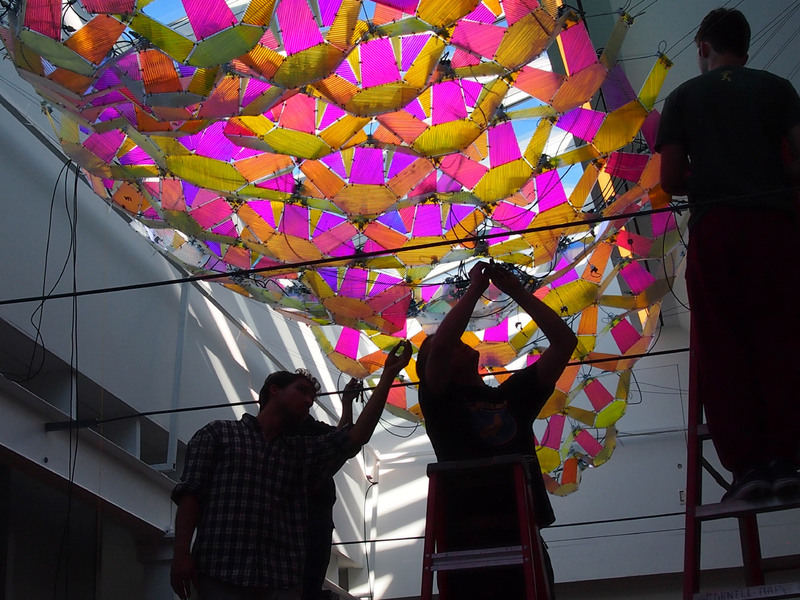 The modules open or close in response to the density of the crowd below, creating a shimmering exploration of structural color—3M’s dichroic film produces color by scattering and diffusing light through nanoscale structures rather than using pigments. Visitors below the ColorFolds installation were treated to chromatic, shifting displays of light as the flock-like piece rearranged itself. UniFolds reimagined the Unisphere in Queens’s Flushing Meadow Park as part of the Storefront for Art and Architecture show Souvenirs: New New York Icon, which asked architects and artists to produce objects inspired by New York City icons. The 140-foot-tall, 120-foot-diameter landmarked Unisphere was the centerpiece of the 1964 World’s Fair, and Sabin Design Lab’s UniFolds piece references the utopian aspirations of the sphere and domed architecture more broadly. 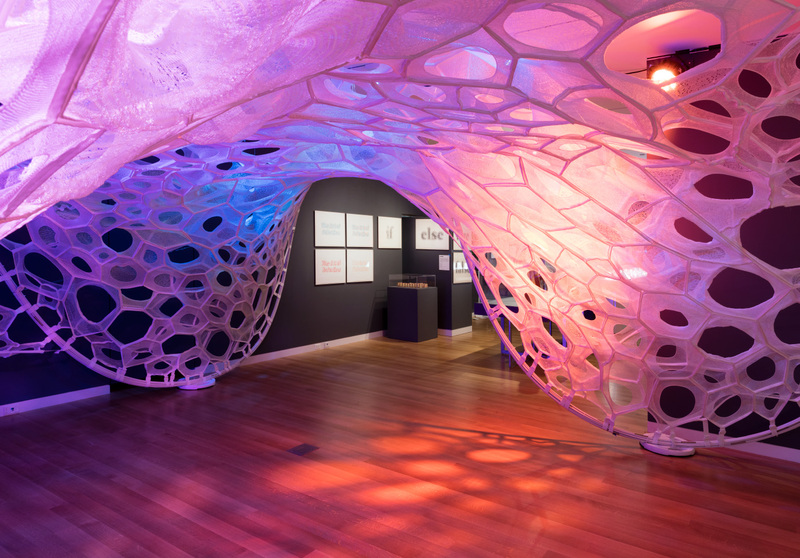 By using holes, folds, and strategic cuts, Sabin Labs has envisioned a modular dome system that’s quick to unfold and can be replicated at any scale, which is part of the “Interact Locally, Fold Globally,” methodology used to guide both kirigami projects.